What if you could walk on water? Better still, what if you could cycle instead? If memory serves me well, my own childhood mental excursions ventured to these possibilities back in central Florida. If only the inventor of Schiller Bikes, Judah Schiller had been around back then! The land of 1000 lakes, is a magic place in my memory. Places like Silver Springs, Winter Park, Lakeland, Lake City and others attest to that part of Florida’s watery soul. What a bonanza this market would have been, for anyone ingenious enough to create a true cycling experience on water. But for us kids back in the 1960s, paddling a canoe and peddling a bike were distinctly separate activities. Now touring a water wonderland via bike has been made commonplace. Today’s exuberant peddling aficionados are inherently lucky. The technological advancements that bolster road cycling, they also enable unimaginable water-cycling experiences. 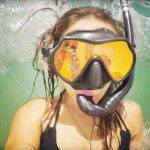 Silver Springs was world famous for its “glass bottom boats”, which revealed an underwater world. And now Schiller Bikes afford an equally breathtaking window to the world beneath the waves. It was this aspect, which prompted me to write this story, in fact. As a consumer advocate of some note, I made a profession of scrutinizing tech, as it applies to user experience. And so Schiller’s engineering item, in use around the world, offers a striking potential. I contacted a Schiller advocate in Sweden, in order to illustrate my meaning here. Stockholm Water Bikes owner Lee Rosario has an interesting business. He leases and sells high performance Schiller S1 water bikes, but he also leads group rides and tours on the water, around Stockholm. To be more specific, Rosario’s business operates in perhaps the perfect location for touring Hornstull, Södermalm, in Södermalm, the relaxed, creative and trendy Island at the center of Stockholm. People who have never visited Stockholm often fail to realize, Scandinavia’s capital is founded on 14 Islands in the Stockholm archipelago, of the Baltic Sea. I caught up with Lee last week, in order to get his take on the growing demand for Schiller water-bikes. Lee is originally from London, he told me he moved to Sweden 3 years ago to be near his girlfriend. Impressed with the aquatic paradise surrounding Stockholm, the Londoner decided to go “all out” to create a unique experience for like-minded aquatic enthusiast. Stockholm Waterbikes began as a water-bike rental concept. The popularity of the streamlined Schiller Bikes soon revealed more far reaching potential for Lee’s vision though. The Stockholm entrepreneur went on talking about water bike users’ interest in the Schiller S1. According to Rosario, his customers are unanimously impressed. First among water bike renter impressions, the streamlined quality of the water bikes is impressive. But it’s the amazing stability and performance of the water bikes he says customers are most impressed with. In fact, Lee tells us the bikes represent a kind of paradigm shift, the potential for, “not only Schiller bikes, but for a sub-culture of water biking to hopefully emerge on a larger scale using the Schiller S1 as an inspiration,” he says. The vision, in Schiller’s case, is not limited to dreamscapes of honeymooners pedaling over the deep blue sea. Rob Kortus at Road Bike Rider (RBR) called the Schiller Bike” an exceptional piece of engineering”, and that it is. 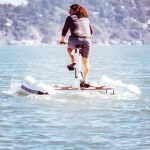 Knowing something of engineering, water craft, and cycling myself, it’s not hard to glean just how much thought and effort has gone into making these extraordinary water bikes. From the portability-collapsibility aspects, to stability and performance, Schiller has jumped every hurdle to make a superior water vehicle. As impressed as Kortus (above) was with the portability aspects, I was duly fascinated by Schiller’s attention to salt corrosion and performance via the bike’s special gear box and Gates Carbon Drive belts. Judah assured me, with some exertion, I would be able to do 8 mph (11 kph) or more pedaling a Schiller Bike and easy to do 4-5 for a sustained period. While I’ve not the time right now for a full-spectrum test of the water bike, I have done the research and the math. The Schiller S1 has no competitor today, and this speaks volumes. Judah Schiller’s vision come to reality is something sorely missed in my Dad’s time, and in my childhood explorations too. Schiller has created a true biking experience replete with the handling, speed, and portability represented in traditional cycling. And while landlubbers ride in the midst of the automotive throng, dealing with the inevitable “road rash” of “biting the pavement”, water bikers enter the natural realm riding the surface of this magical blue planet. Oh to imagine a Schiller Bike at Weeki Wachee or Silver Springs way back when. Those glass bottom boats would have died with envy. The horizon is very bright, and just up ahead for Judah Schiller’s dream.